The clue (as the tide washed out from under them) indicates that the whales guided by the incoming tide to the edge of high water mark and lingered there until the tide dropped from under them. They were then considered stranded. This is exactly what should be expected from an entire pod that had lost its acoustic sense of direction. The same appears true in the picture below. You can see the high tide mark near the grass. These whales were guided slowing to the shore as the tide was rising until they could swim no closer. Then, as the tide dropped and the water flow from under them, they were left lying on the rocks. If they has an acoustic sense of direction, they could have easily turned away from the rocks and swam out to deeper water. This is exactly what we would expect from a pod of totally lost whales. You'll find a lot more about how the surface currents control the swim path of stranded whales at this link. On 5 August 2015, 14 lost pilot whales from the same pod stranded at Bayfield in St George's Bay. Locals began pushing them back into the water as darkness fell. 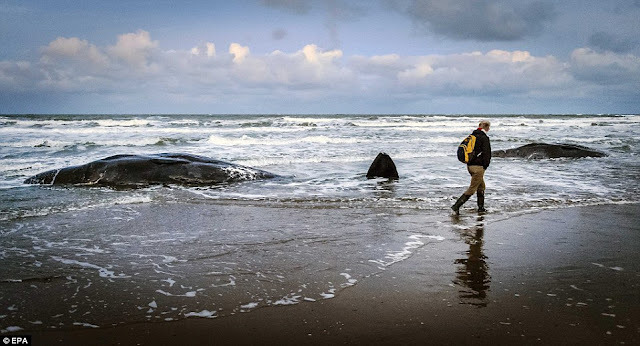 However, during an incoming tide, the lost whales were guided back to the beach. That stranded whales move back and forth with the flow of the tidal current is solid proof that they have no sense of direction on their own. The locals were back at the beach at the crack of dawn Thursday morning. The mistaken human interpretation of why this event occurred was given by Tonya Wimmer, president of the Marine Animal Response Society. Keep in mind that the save-the-whale folks MUST convince themselves that the whales are healthy, otherwise they would not feel too good if they knew the loving mammals they push off the beach could not navigate and will eventually be ripped apart by hungry sharks. Tonya Wimmer said, “They're matriarchal, like elephants, with lead females. So when one of the whales hears others in distress, it’s their aunts and their cousins and they all go to their aid.” This mistaken view is not supported by one tiny bit of evidence. Furthermore, how is it possible for a human to interpret whale clicks and emotions? Tonya's concept stems from human imagination and is as wrong as wrong can be. That pods of pelagic whales beach themselves due to emotional attachment or to some stupid mistake is naturally the lead concept publicized by all the rescue groups because they depend on donations from folks who feels sorry for the loving whales. The public is not gonna donate to push whales off the beach if there is zero chance for recovery. But the rescuers are doing some good! They are feeding earthquake-injured non-navigating whales to hungry sharks. Sharks need our protection too. Under the laws of nature, the wounded and dying whales rightfully belong to the sharks unless humans have a way to rehabilitate their biosonar system and make them healthy again. Rehabilitation is possible. But pushing sick whales back out into the sea without knowing WHY they strand is cruelty to animals. Dreaming up wild guesses about the cause of beachings just to make humans feel good about pushing injured whales off the beach is sick behavior and must stop. We MUST understand why whales strand themselves before we can develop ways to truly save them. Whale scientists and push-the-whales-off-the-beach groups must stop lying to the public and get behind an effort to educate the public. Now back to the stranded whales. By 9:30 a.m. when the tide was flowing out to sea, all the whales had swim back into deeper water and a small response craft was supposedly shepherding them, trying to keep them swimming with the outgoing tidal flow. Guiding lost whales in a downstream direction is easy. In fact, if the whales are not pushed off the beach when the tidal current is flowing out to sea, they will turn around and come back to the same beach. The whale scientists and the so-called rescuers know this to be true but will not inform the public because such information is solid proof that the whales have LOST their acoustic sense of direction. And this ain't rocket science. That beached whales always swim with the flow is easily observable if one just opens his or her eyes. STRANDED WHALES ALWAYS SWIM DOWNSTREAM IN THE PATH OF LEAST DRAG! 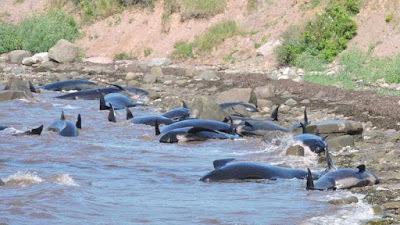 So why did these pilot whales lose their acoustic sense of direction and end up stranded in St. George's Bay? Since we KNOW that they are swimming with the flow, we need to trace back upstream and see if we can find some type of undersea natural upheaval that might knock out their acoustic sense of direction. The nearest and most favorite upstream feeding grounds for pilot whales is the earthquake-prone Reykjanes Ridge, a volcanic mountain range that runs south of Iceland to connect up with the Northern Mid-Atlantic Ridge, another volcanic mountain range that runs down the center of the Atlantic Ocean. Lots of squid hang out here because they use the warm bottom water of these volcanic hot spots to help incubate their eggs. Naturally, pods of pelagic whales and dolphins follow their favorite food no matter where the food goes. Click here to see a map of the 3 possible undersea earthquakes along the Reykjanes Ridge. If you learn how to use this web page, you will be able to check for the cause of mass strandings by yourself. My experience tells me that the event that occurred in the early morning of 16 July 2015 is the best choice. It was a shallow magnitude 4.7 quake that occurred along the southern portion of the Reykjanes Ridge (link) at 55.44 N latitude by 35.27 W longitude. The earthquake data shows that this event was 10 km below the ocean's surface, but this is only a minimum default value. The actual depth below the seabed might have been only 3 to 4 km deep. Very shallow quakes are more dangerous because the seismic energy has little chance to spread out before it reaches the rock/water interface. Furthermore, during events in which the focus is less than the length of the seismic waves, the rock/water interface becomes anomalously transparency allowing the seismic waves to pass from one medium to the other without energy loss. Furthermore, as you can see by looking at the scientific data, many stations recorded this event as being as high as 5.3 magnitude. The event was also strong enough to be recorded by 305 stations worldwide. It even registered 310 phases indicating to this researcher that it was a whale-dangerous quake. Click here to see a detailed chart of the quake area. Click here to see the type of faulting. As the beachball indicates, this event shows normal faulting in the vertical plane. During a normal fault, one block moves down relative to the other. This motion is due to tensional forces and results in a negative pressure (dilation or vacuum phase) being the first pressure change encountered by the whales. In other words, the diving pressures would have dropped suddenly. A negative pressure phase might have dropped the pressure to 400 p.s.i. below ambient. This would cause the air in the whales' cranial airspaces to overexpand instantly. This rapid expansion would have been followed almost immediately by a equally rapid compression phase sending the diving pressure to 400 p.s.i above ambient. The speed/rate at which the pressure changed would equal the frequency of the quaking motion in the seabed, which on average is about 14 half-cycles every second. The rapid changes of the volume of air inside the flexible air spaces would establish shearing forces at the boundary between the air compartments and the bones, flesh, fat and other tissues that do not change volume during pressure changes. The injury could be scattered all around the air chambers and may be difficult to see by the time the pod reached the beach. The point is simple: such a natural seafloor upheaval would have indeed injured the sinuses and every whale caught off guard while down on a feeding dive. This has no doubt been going on for millions of years. Furthermore, because sinus barotrauma is the most common injury in all divers, there is no reason to believe that sudden pressure changes generated by earthquakes, volcanic explosions, meteorites crashing violently into the ocean's surface, military sonar, oil industry airguns, and explosions would not damage the enclosed air pockets of any diving whale within the danger zone. Here's the important point: The air in the whales' massive cranial air spaces serves to reflect, channel, and focus returning echo clicks. The air is also used to isolate each cochlea so that odontoceti whales hear stereoscopically. If they lose stereoscopic hearing and/or the channelling and focusing of their returning echo clicks, they lose the ability to navigate, and to dive and find their food. The pod becomes as lost at sea as a blind man tossed overboard in the middle of a midnight storm. Without a sense of direction, the only way they can possibly swim is downstream in the path of least drag. The surface currents near the epicenter flowed towards the eastern shore of Greenland, then around Greenland and on towards Newfoundland and then south with the usually countercurrent. This pod was likely pulled into the Gulf of Saint Lawrence near Belle Isle on an incoming tide and then through the Gulf to the Gulf side of Nova Scotia and then into St. George's Bay. Click here to see a google map that shows the approximate downstream course taken by the lost pod. The time of the event, the distance traveled, the arrival at St George's Bay, and the tidal currents all support this particular quake as being responsible for the pod's loss of navigation. One last point: Three pilot whales stranded at Brandon on the Dingle Peninsula in West Kerry, Ireland on the morning of 7 August (link). These 3 exhibited the same behavior as the two groups in Nova Scotia. I have search all the data banks and cannot find a separate dangerous event to account for the Ireland stranding. My opinion now is that the 3 whales on the Dingle Peninsula are from the same pod that stranded in Canada. I think there was a storm at sea shorting after the earthquake that separated the 3 whales from the main group. These 3 whales swam into a filament of current going the opposite way as the main group and ended up stranding in Ireland.